Considered to be one of the greatest operatic tenors of modern times, Plácido Domingo does more than rest on his legendary laurels these days. In fact, for his first performance in over 20 years in San Antonio, he’ll be performing at the Alamodome on June 19. “The passion I feel for performing is the same as I felt at the beginning my career,” Plácido Domingo says. “And San Antonio is such a beautiful and charming city.” The King of Opera, as he is affectionately known to many, has won nine Grammy Awards, two Latin Grammy’s and his performance track record includes over 123 roles performed to date. Known as one of the Three Tenors of the operatic singing phenomenon, he may just be the most sought after performer in music. And Texas welcomes him with open arms again. Just wanted to send over the details on Plácido Domingo's concert in June. This is the first time in 20 years that he has visited San Antonio. The San Antonio Opera, our client, is very happy to host him and we are inviting everyone statewide to make a trip to San Antonio to see him in concert. Are there any pieces of work you have not performed that you would still like to perform? Do you enjoy performing solo - than with others on stage with you? Perfroming solo is charaming – making a character – doing concerts is very challenging and very beautiful. (SAN ANTONIO – Mar. 1, 2007) –San Antonio Opera is proud to announce its 2007-08 season, to be presented at the Lila Cockrell Theater: Puccini’s La Boheme, Donizetti’sElixir of Love, and Puccini’s Tosca. San Antonio Opera and AT&T also announce Plácido Domingo in Concert on June 19, 2007 at the Alamodome. San Antonio Opera is honored to present a concert by tenor superstar Plácido Domingo. Hailed by many as the King of Opera, Domingo is without question one of the most prolific figures in music today. Winner of 9 Grammy Awards and 2 Latin Grammy’s, his repertoire includes some 123 roles performed to date. One of the 3 Tenor phenomenon, he is by far the most sought after performer in music. Highlighting the 2007-2008 Season will be stage direction by Hollywood legend, Garry Marshall. Marshall is responsible for the creation of some of television’s most popular sitcoms, including Mork and Mindy and The Odd Couple. As a movie director, his credits include Pretty Woman, Beaches, Runaway Bride and many others. As an actor he was most recently seen starring in Keeping up with the Steins. Marshall brings his comedic expertise to Elixir of Love. The San Antonio Opera recognizes the dedication and contributions of the following organizations: title sponsor AT&T; co-sponsors The Tobin Endowment, Ewing Halsell Foundation, and Kronkosky Charitable Foundation; along with The Russell Hill Rogers Fund for the Arts, H-E-B and other sponsors. In addition title sponsor AT&T has provided funding for an educational initiative that will touch the lives of thousands of children in the next 4 months. Season ticket prices range from $55.00 to $250.00 for all 3 operas. Tickets for Plácido Domingo in Concert range from $25.00 to $250.00. Plácido Domingo in Concert tickets can be purchased in conjunction with San Antonio Opera season tickets beginning March 10, 2007 by calling the San Antonio Opera Box Office at 210-225-5972. Plácido Domingo in Concert tickets may be purchased separately through TICKETMASTER, 224-9600, or the Alamodome Box Office beginningMarch 26, 2007. Patrons may request a brochure by calling 210-225-5972, or by e-mailing boxoffice@saopera.com. Other information can be viewed at www.SAOpera.com. AT&T Inc. supports programs that strengthen communities; improve access to information technology and technology training; advance education; and enhance professional-skills development. In 2006, AT&T contributed more than $101 million through corporate-, employee- and AT&T Foundation-giving programs. AT&T AccessAll, the company's signature philanthropic initiative, is a $100 million program that connects families and communities with technology that can improve lives. AT&T and the AT&T Foundation, the philanthropic arm of AT&T, combine more than $1.8 billion of historic charitable commitment to communities across the country. 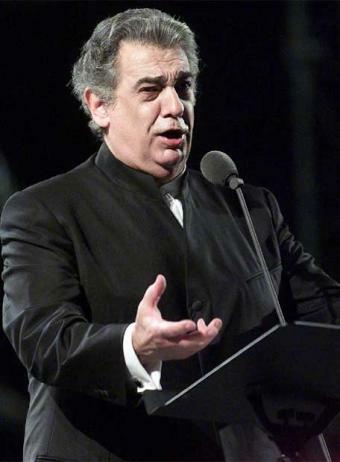 Plácido Domingo was born in Madrid, Spain, and moved to Mexico at age 8 with his family, who ran a zarzuela company. In Mexico City he studied music at the National Conservatory. He provided backup vocals for Los Black Jeans in 1958, a rock-and-roll band lead by César Costa. He learned piano and conducting, but made his stage debut acting in a minor role in 1959 (May 12) at the Teatro Degollado in Guadalajara as Pascual in Marina. It was followed by Borsa inRigoletto, Padre Confessor (Le dialogue des Carmelites) and others. He made his operatic debut acting as a leading role at Monterrey as Alfredo in La Traviataand then in 1962 spent 2 and a half years with the Israel National Opera in Tel Aviv, singing 280 performances of 12 different roles. On September 19, 1985, the biggest earthquake in Mexico's history devastated the whole Mexican capital. Domingo's aunt, uncle, his nephew and his nephew’s young son were killed in the collapse of the Nuevo León apartment block in the Tlatelolco housing complex. Domingo himself labored to rescue survivors. During the next year, he did benefit concerts for the victims and released an album of one of the events. In what has been called his 'final career move', Placido Domingo announced on January 25, 2007 that in 2009 he would switch ranges to baritone by taking on one of Verdi's most demanding baritone roles, as the Doge of Genoa, Simon Boccanegra, in the opera of the same name. Giving him even greater international recognition outside of the world of opera, with José Carreras and Luciano Pavarotti, he participated in The Three Tenors concert at the opening of the 1990 World Cup in Rome. The event was originally conceived to raise money for the José Carreras International Leukemia Foundation and was later repeated a number of times, including at the three subsequent World Cup finals (1994 in Los Angeles, 1998 in Paris, and2002 in Yokohama). Alone, Domingo again made an appearance at the final of the 2006 World Cup in Berlin. Born in Madrid to parents who were Zarzuela performers, Plácido Domingo moved to Mexico at the age of eight. He went to Mexico City's Conservatory of Music to study piano and conducting, but eventually was sidetracked into vocal training after his voice was discovered. He made his operatic debut at Monterrey as Alfredo in "La Traviata" and then spent 2 ½ years with the Israel National Opera in Tel Aviv, singing 280 performances of 12 different roles. In 1966, he created the title role in the United States premiere of Ginastera's "Don Rodrigo" at the New York City Opera while appearing there in standard repertory as well. His Metropolitan Opera debut came in 1968, as Maurizio in "Adriana Lecouvreur. He has subsequently appeared there in more than 590 performances of 42 different roles and is now in his 38th consecutive season with the company (2006/7). He appears regularly at all the big opera houses of the world, including Milan's La Scala, the Vienna State Opera, London's Covent Garden, Paris' Bastille Opera, the San Francisco Opera, Chicago's Lyric Opera, the Washington National Opera, the Los Angeles Opera, the Teatro del Liceu in Barcelona, Teatro Colon in Buenos Aires, the Real in Madrid, and at the Bayreuth and Salzburg Festivals. Domingo's recordings, whether complete of operas , aria or duet albums or cross-over material, inevitably appear on the best seller charts and at one time, seven of his CD's appeared simultaneously on Billboard's top-selling charts of classical and cross-over recordings. Eight of his records have gone gold, meaning they have sold well over one million copies. Four of his most recent recording projects have been a double CD of every aria Verdi wrote for the tenor voice, a CD of excerpts from Wagner’s “Siegfried” and “Götter-dämmerung” which includes most of the music written for the Helden-tenor part of Siegfried and two complete Wagner operas, the first a complete “Tristan und Isolde” with soprano Nina Stemme and Anthony Pappano conducting the Covent Garden Orchestra, and the second a complete “Parsifal” with Waltraut Meier and Christian Thielemann conducting the orchestra of the Vienna Staatsoper. In a less Verdian or Wagnerian mood there have also been Puccini’s early opera “Edgar” and a CD devoted mostly to Neapolitan songs, under the title “Italia ti amo”. His repertoire - 123 different roles, as mentioned earlier - includes almost all important parts in the Italian and French operas. Being constantly challenged by new roles, his ever expanding foray into the German repertoire consists of Wagner's "Parsifal", "Lohengrin" and Siegmund in "Die Walküre", in addition to recorded performances of “Meistersinger", "Tannhäuser" and “The Flying Dutchman", of Richard Strauss, "Die Frau ohne Schatten", of Weber's "Oberon" and of Beethoven’s “Fidelio”. Within the past five years he added to his stage performances his first role in Russian, Gherman in Tchaikovsky’s “Queen of Spades”, the Spanish Opera "Margarita la Tornera” by Roberto Chapí, Verdi's "La Battaglia di Legnano" and Alfano’s “Cyrano de Bergerac”. Unlike many of his colleagues, he is also interested in broadening his repertory with new compositions, such as Anton Garcia Abril's "Divinas Palabras," Deborah Drattell's "Nicholas and Alexandra”, with him as Rasputin. Also new for him, in his extensive recorded repertoire are two Spanish operas, Breton's "La Dolores" and Albeniz’s “Merlin", for which he won a Latin Grammy. Domingo's interest in helping young singers has led his yearly competition "Operalia” which so far has taken place twice in Paris, Mexico City, Madrid, Bordeaux, Tokyo, Hamburg, Puerto Rico, Los Angeles, Washington and a combination of Switzerland (St. Gallen), Austria (Bregenz), and Germany (Friedrichshafen, Isle of Mainau) and Valencia. It remains the biggest on the international scene with annual prizes amounting close to $200.000. It has launched many singers to international recognition, not only through its prizes but because of Domingo's continued interest in furthering their careers. The past four years also saw the inauguration of the Domingo-Cafritz Young Artist Program of the Washington National Opera and the Domingo-Thornton Young Artists Program of the Los Angeles Opera – other examples of his efforts to pave the way for opera’s future stars – a topic which formed the nucleus of a recent “60 Minutes” segment on him. Since 1993, he also has a star on the Hollywood walk of fame. Plácido Domingo (www.placidodomingo.com) -- singer, conductor and administrator. By now be has sung 123 different roles, more than any other tenor in the annals of music, with at least two more new roles planned in the next three seasons. His repertoire spans the gamut from Mozart to Verdi, from Berlioz to Puccini, from Wagner to Ginastera. He sings in every important Opera House in the world and has made an unparalleled amount of recordings of which 101 are full-length operas, often recording the same role more than once, and for which he has earned nine Grammy's and two Grammy's in the newly established Latin Division. He has made more than 50 videos and 3 theatrically released films which are Zeffirelli's "Traviata" and "Otello" and Francesco Rosi's "Carmen. His telecast of "Tosca” from the authentic settings in Rome, was seen by more than 1 billion people in 117 different countries. By now he has opened the Met season a record-setting 21 different times, having by-passed in 1999 the old Caruso record of 17 opening nights. As a conductor he has led opera performances in all the important theaters from the Metropolitan to London's Covent Garden and the Vienna State Opera and has conducted purely symphonic concerts with such renowned orchestras as the Berlin and Vienna Philharmonic, London Symphony and the Chicago Symphony, while also making recordings as a conductor. As administrator he was the music director of the Seville World’s Expo Fair and in this capacity invited the world's foremost orchestras and opera companies including the Metropolitan Opera, to Seville, Spain. He is today the General Director of both the Washington National Opera (www.dc-opera.org) and of the Los Angeles Opera (www.losangelesopera.com). Both companies enjoy today special artistic acclaim and financial stability. Born in Madrid to parents who were Zarzuela performers, Plácido Domingo moved to Mexico at the age of eight. He went to Mexico City’s Conservatory of Music to study piano and conducting, but eventually was sidetracked into vocal training after his voice was discovered. He made his operatic debut at Monterrey as Alfredo in "La Traviata". In 1966, he created the title role in the United States premiere of Ginastera's "Don Rodrigo" at the New York City Opera while appearing there in standard repertory as well. His Metropolitan Opera debut came in 1968, as Maurizio in "Adriana Lecouvreur. He has subsequently appeared there in more than 590 performances of 42 different roles and is now in his 38th consecutive season with the company (2006/2007). He appears regularly at all the big opera houses, including Milan’s La Scala, the Vienna State Opera, London's Covent Garden, Paris' Bastille Opera, the San Francisco Opera, Chicago's Lyric Opera, the Washington National Opera, the Los Angeles Opera, the Teatro del Liceu in Barcelona, Teatro Colon in Buenos Aires, the Real in Madrid, and at the Bayreuth and Salzburg Festivals. copies. Four of his most recent recording projects have been a double CD of every aria Verdi wrote for the tenor voice, a CD of excerpts from Wagner’s “Siegfried” and “Götter-dämmerung” which includes most of the music written for the Helden-tenor part of Siegfried and two complete Wagner operas, the first a complete “Tristan und Isolde” with soprano Nina Stemme and Anthony Pappano conducting the Covent Garden Orchestra, and the second a complete “Parsifal” with Waltraut Meier and Christian Thielemann conducting the orchestra of the Vienna Staatsoper. In a less Verdian or Wagnerian mood there have also been Puccini’s early opera “Edgar” and a CD devoted mostly to Neapolitan songs, under the title “Italia ti amo”. Domingo's interest in helping young singers has led his yearly competition "Operalia” (www.operalia.org) which so far has taken place twice in Paris, Mexico City, Madrid, Bordeaux, Tokyo, Hamburg, Puerto Rico, Los Angeles, Washington and a combination of Switzerland (St. Gallen), Austria (Bregenz), and Germany (Friedrichshafen, Isle of Mainau) and Valencia. It remains the biggest on the international scene with annual prizes amounting close to $200.000. It has launched many singers to international recognition, not only through its prizes but because of Domingo's continued interest in furthering their careers. The past four years also saw the inauguration of the Domingo-Cafritz Young Artist Program of the Washington National Opera and the Domingo-Thornton Young Artists Program of the Los Angeles Opera – other examples of his efforts to pave the way for opera’s future stars – a topic which formed the nucleus of a recent “60 Minutes” segment on him. Opera; “Tosca” at the Vienna Staatsoper and he continues to sing concerts throughout the world. "The greatest operatic artist of modern times".